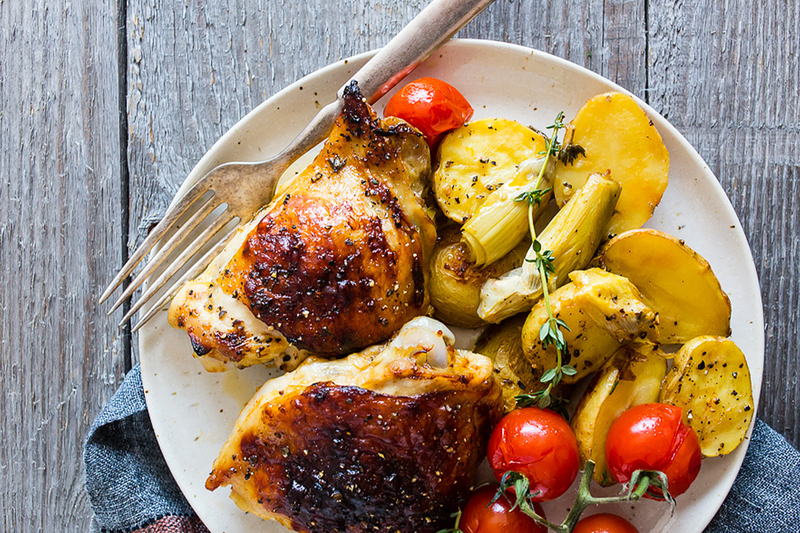 This sheet pan French dressing chicken thigh dinner is the perfect combination of BRIANNAS Zesty French dressing tossed with baby potatoes, artichoke hearts and vine-ripened tomatoes. It goes from pan to oven to plate in under an hour! Recipe by the blogger of "Nutmeg Nanny"
Preheat your oven to 375 degrees and line a large rimmed baking sheet with a Silpat liner if you have one. If not, you can either leave it plain or line with foil if desired, set aside. In a large bowl whisk together BRIANNAS Zesty French Dressing, fresh thyme leaves, lemon zest, black pepper and kosher salt. Add in chicken, toss, shake off any additional dressing (you want it to just coat the chicken not be dripping from the chicken) and add to your prepared sheet pan. In the same bowl with the dressing add the potatoes and artichokes. Toss to combine and add the potatoes and artichokes to the pan, surrounding the chicken. Bake for about 40 minutes, remove, scatter on the tomatoes and add back to the oven and cook for about 10 minutes longer or just until the tomatoes are just beginning to burst. Serve hot with additional dressing if desired.